We LOVE passive income! Having a few passive income streams as a developer or designer can really set you free both financially and timewise. Although they require an upfront investment (and sometimes maintenance), they can bring you consistent revenue for years to come. We have listed 11 strategies that we use to generate side income besides our work as designers and web/app developers. What could be better than making money while doing other stuff that is equally important to you, such as working on your health or strengthening personal relationships with family and friends. Passive side income also allows you to work on new passive income opportunities 😉 It is a gift that keeps on giving – if you do it right. And of course, there is the debate “How passive is passive income?” To me, passive income means: putting online a well-crafted digital product that people can consume for a long time and that generates revenue while I am doing something else that has nothing to do with that product. If that product is doing well (or not), I can CHOOSE to make it even better, promote it, or maintain it. Do affiliate marketing & advertising still work? 1. Do affiliate marketing & advertising still work? Many designers and developers already have a website running, so for them, affiliate marketing is a no-brainer. Start writing substantial blog posts of at least 1000+ words on a topic of interest that has low competition in the Google search results. Some of your posts (I recommend 1/3) can be tied to a product that is of interest to your readers. When people click on the affiliate link you earn a commission of a few percents. The Amazon affiliate program is one of the easiest programs out there that can make you a commission of 1-10%. The advantage of Amazon is that they will always have a product in their listings that are of interest to your target audience. Other affiliate programs are Shopify and Thirsty Affiliates. 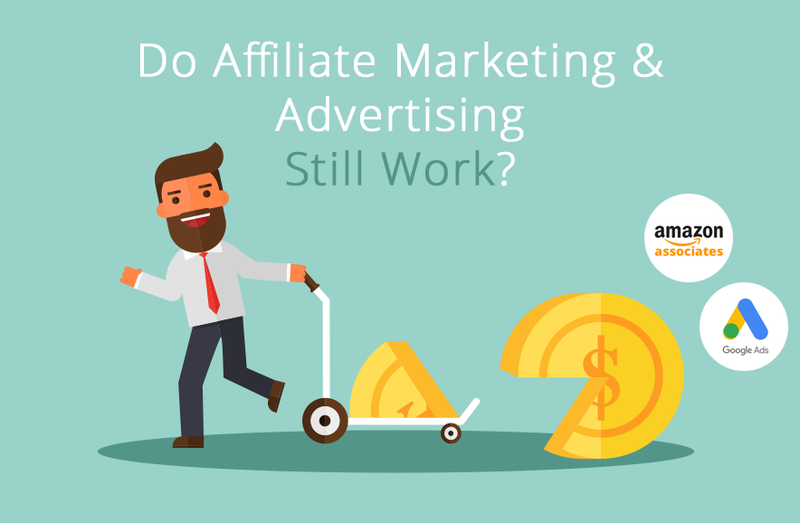 An often heard question is “Does affiliate marketing still work in 2019?” The answer is short and simple: “Yes!” But… it has to be done the right way. We recommend that you only refer to products that you and your readers are passionate about, are worth more than $100 and less than $300. The reason for this is that you want your visitors to buy the product right away. If a product is relatively expensive, they will probably do more research before purchasing and you miss out on your commission. Example: An average conversion rate of a good affiliate product is around 5%. So if your webpage has 5000 visitors per month and 250 people buy a product of let’s say $100 with a 3% commission rate, this would result in a side income of $750 each month, from a webpage that took you a few days to write. Don’t be surprised if this page still generates income 3 years later down the line. Monetizing your blog with ads, on the other hand, is getting more and more difficult. The main reason for this is the increasing popularity of ad blockers. And even if they do show up, ads will earn you peanuts. So they require a huge amount of traffic to be worthwhile. And if you do have a lot of traffic, I suggest you monetize it through a good affiliate product! If you do not have a website yet, I recommend you start one today. Start with good web hosting that allows you to have multiple websites running on your web server and that offer free SSL certificates. We recently moved over to Siteground because of their speed, ease of use and their relatively low costs. We chose the Grow Big Hosting Package. Self-publishing an ebook on Amazon’s Kindle Direct Publishing, Payhip, Shopify, Selz, or Feiyr can be very lucrative. First, create good content and have it proofread by someone on Fiverr. After that make sure you design a great cover that really sells your ebook. 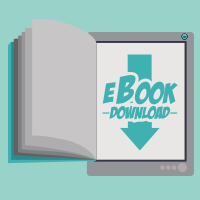 After you publish your ebook on one of the platforms mentioned above, promote it on social media (or pay for a Facebook ad) and websites that are in your niche. Not sure if you can write a complete book? All the content is somewhere on the Internet. Just repackage it in a structured way and pour over your secret sauce. Sell your valuable knowledge online through a course on platforms like Udemy, Treehouse, or Code school. There is an incredibly high demand for programmers at the moment (and probably for years to come). So if you have specific programming skills, develop a high-quality course that differs from the rest. It helps if you have programming skills, but even if you don’t, there are great ways to have your mobile apps in the Google Play store and App store. There are many platforms such as GameSalad that make it easy for you to develop an app that is platform-independent. You could even buy a complete app on their marketplace for a few dollars. After that, you can improve and make it more “sellable”. You would be surprised at how much you earn from apps that don’t seem to be very special but do well because they look awesome or rank high in search results. I prefer developing free apps that have In-App Purchases. Tip: Try developing a localized app for a smaller country/community that has less competition. We do well in German Math apps 😉 we have an exact copy in the US that doesn’t do well at all. If you are a graphic designer you probably develop your images in Illustrator or Photoshop and have many vector-based or high-resolution images that are not being used at the moment. Browse through your work and see if you can sell your work on Etsy. Maybe you have beautiful photos you can license to Stock photo websites such as Shutterstock. OK, I admit this does not fully classify as passive, but it is doable for most developers and designers who are doing client work. The easiest way to free up time is by outsourcing as much as possible. You will maintain the decision-making or visionary role, but you bring on other people to handle simpler tasks. These tasks can often be performed by less experienced people at a lower price. 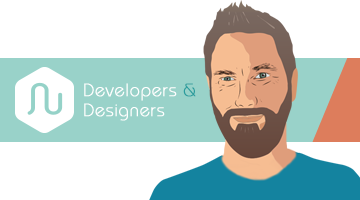 Why is this a passive income tip for developers and designers? Well, cryptocurrencies and blockchain are all about technology. In my opinion, the cryptocurrency market, Bitcoin in particular, is just as disruptive as the dotcom bubble was in the late 1990s. And boy, I wish I had paid more attention to it back then! So pay close attention now, while it has not yet become mainstream, and invest some money into Bitcoin (never more than you can afford to lose, of course). Overcome your public speaking fears and start a YouTube channel! YouTube is the second biggest search engine. Many people (especially the younger generations) prefer YouTube to Google. There is money to be made on YouTube ads and affiliate links that you put in the description below the videos. Not sure what to talk about? Interview a friend or colleague on a certain topic and record it. If you don’t want your face in front of the camera you can hire someone on Fiver to do it for you. Just send them the text you wrote and let them record it. You can edit the video by adding images, sound and other effects to it. Many of you have developed websites for clients. Do you always use the same WordPress theme or do you make the same theme customizations over and over again? Chances are that many people are looking for the same customizations you make to your theme. So why not develop your own theme and sell it on themeforest.com. A common price for a theme is $30. If you sell your theme 100 times a week that’s $12000 a month. This is not uncommon for an average theme. Be aware that you must support your theme, so be prepared to answer customer questions. Make a good FAQ website for your theme or pay someone that knows your theme to answer questions for you. If you have more technical skills you can consider developing a plugin that is free to download but has some paid futures in it. Since there are millions of WordPress-based websites online (more than 30% of all websites), the potential customer base is enormous. If your plugin really ads value to users and you systematically and nicely ask for donations, you could make serious money. It is worth exploring but a bit more challenging to develop than a theme in my point of view. As a developer, you may have a few domains or websites that are doing nothing at the moment and you don’t have the aspiration to make an income out of it anytime soon. These domains could be very valuable to someone else because they see the potential of it or don’t have the skills to build a website as you do. Put these websites on Flippa and see what people are willing to pay for it. You don’t have to sell it if the price is to low. If you have the skills to beautify a website and you know your SEO, search on Flippa and see if there is a website for sale that you can further develop and monetize. And when it generates income, you can flip it again on Flippa.